I'm in but probably just me unless the bride is feeling up to it. The new knee isn't quite there yet. Unfortunately we have another commitment around noon that day but if we finish up early we may make the tail end to see y'all. There will be enough room to bring the SO or the entire family. Register so we get a head count. No event fee - pay for your own food and beverages. Open to all. How about snow or shine? The forecast at the beginning of the week said I could ride the bike to the Tavern. Better change the tires to accommodate the fresh white stuff. See you good folks there! Really??!!?? What the heck is with snow? 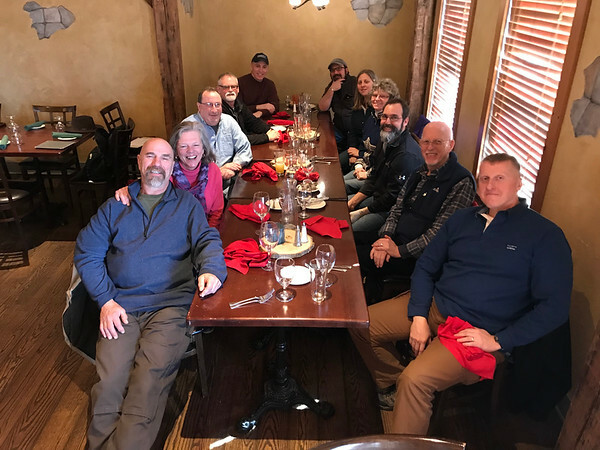 I'm sure waking up to snow scared off some from attending, but nearly a dozen showed up for lunch and COG camaraderie. A good time was had by all. The farthest traveled was Terrynyc who came from the Staten Island.